Superheroes like Iron Man and Batman have dominated many summers with their spectacular action movies. In the last few years superheroes also proved to be capable of taking on more refined, tragic roles. It seems they can truly achieve greatness when they are taken out of their epic context. In “Paper Man” (2009) Captain Excellent, the imaginary superhero friend of a washed up writer, helps his creator to deal with his issues and get a grip on his life. That same year “Defendor” (2009) proved that even the simplest of minds can amount to great things by showing us a mentally challenged man – a hero in his own mind – with no power other than courage, ready to take on the world’s evils. 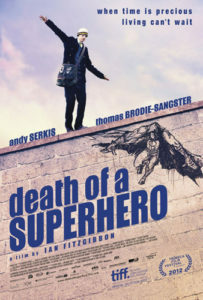 Now, in “Death of a Superhero” (2011) the titular hero stands guard for the last defence of a dying 15 year old boy. Combining a drama about a boy dying from cancer with animated superheroes was definitely a risk. Whether or not the movie succeeded is a difficult question to answer. The acting in the movie is great, as well as its Ireland-based setting. The fact that most of the actors in the movie are relatively unknown gives the movie an extra sense of realism. The struggle young protagonist Donald goes through is backed up by animated sequences based on the character’s own drawings. They represented his feelings and translate them into concepts of heroism. The connection between the animation and “real life” falls short at a few points, but overall “Death of a Superhero” is a good attempt at something new.